The outside area of a home is just as important as the inside. If the outside of your Rhode Island home isn’t as attractive and enjoyable as the inside, exterior renovations can really make it special. Plus, the improvements will make a difference in the equity value of the home. There are certain exterior renovations for your Rhode Island home that will make a big impact. 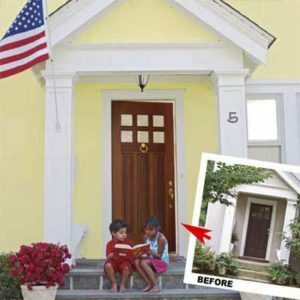 If you want to enjoy your property to the utmost, take a look at the following exterior renovations that are an excellent idea for any home. Our team of professionals can help with any ideas. Masonry work on the exterior of your property is much better than a plain old concrete patio. Whether you brick an old patio or you build an entirely new one with brick or stone, the masonry work will completely transform the exterior of your home. Build a new brick or stone patio so you and the family can enjoy being outdoors more. Oh, and don’t forget to include building a patio cover so you can enjoy it no matter what the weather is doing. An outdoor kitchen is a definite yes as a great exterior renovation. The design can be as simple or as complex as you wish. Hardscaping for the outdoor kitchen can be done in the natural stone of your choice. Imagine how great it would be to gather with friends and family for a fun barbeque outside. An outdoor kitchen will make it easy for everyone and will significantly improve the look and value of your home. Adding to the exterior beauty and insulation factor of your home with new siding is a great idea. Vinyl siding can be installed over any existing material on the exterior of your home. It brings instant value and beauty to your property. Vinyl siding comes in an array of styles, colors, textures, and patterns. You don’t have to stick with the same standard clapboard look if you don’t want to. Today, it is molded and pre-formed to look like wood, stone, and brick. What’s great about this new siding is the durability, it stays beautiful for years on end. If you would like more information or ideas about Exterior Renovations in Rhode Island, please call us today at 401-434-6600 or complete our online request form.